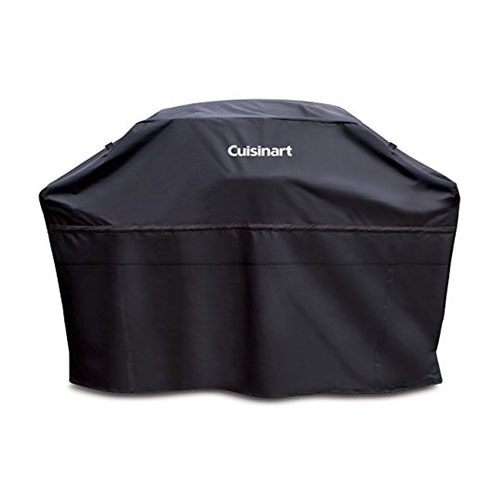 The Cuisinart CGC-60B is a 60" heavy-duty barbecue grill cover. This cover is the perfect combination of durability and convenience. With wind and water resistant fabric, the grill will stand the test of time and be safe from the elements and even UV rays. The dual-sided vents will dissipate excess heat and prevent condensation. This cover has snapping lock wheel fasteners and adjustable draw strings. Additionally, the easy-access flap built into the cover allows for quick access to fuel tank. The dual-sided grip handles allows the cover for easy removal. 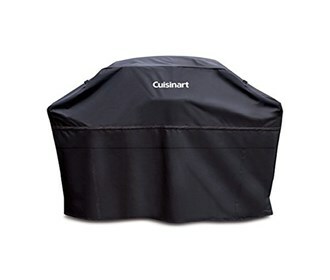 The Cuisinart Grill Cover 60 Inch Rectangle has many exciting features for users of all types. You can extend the lifetime of your Cuisinart Grill Cover 60 Inch Rectangle with the purchase of a FactoryOutletStore Factory Protection Plan. See the Cuisinart Grill Cover 60 Inch Rectangle gallery images above for more product views. The Cuisinart Grill Cover 60 Inch Rectangle is sold as a Brand New Unopened Item.